If you want to learn fly tying from scratch, have problems with fly tying, want to improve more and etc, why don't you join our fly tying lesson. Fly tying has no rule so anybody can start by her/himself but there is a limitation to improvement. 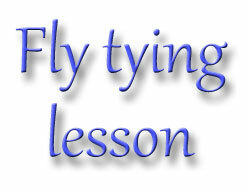 We show you how to tie cool and effective flies, solve your problems and correct what is wrong. Fly tying lesson is held here in Sapporo. It is a small room in an apartment but should be enough for most tying demonstrations. If you want the lesson at your designated location, we might be able to do it at your extra cost. Basic tying materials and tools are included. You may take pictures of the demo but no motion picture. Uploading in the internet is banned without authorization.